I love la Vuelta a Espana. I know I’m supposed to make snide comments about it being ugly, disorganised and poorly attended, but I can’t. I’ve got a real soft spot for it. So much so that I couldn't even keep my original blog title: "look at my f*cking red jersey". Recent editions have been thoroughly enjoyable. 2010 saw a brilliant four way fight between Nibali, Anton, Rodriguez and Mosquera, with each rider taking it turns to look like the strongest in the race before being trumped by his rivals in an escalating series of mountain battles. Eventually Rodriguez blazed up Pena Cabarga as a last hurrah before haemorrhaging minutes in the ITT. Anton hit a bit of discarded 2 x 4 and crashed out wearing the leader’s jersey, and eventually we were left with a cracking defensive ride on the misty, steepening ramp of Bola del Mundo, with Nibali bravely grinding after Mosquera, closing a threatening gap to defend his lead. Then in 2011 we had an even better edition - one in which Wiggins marked his rivals with intelligence and strength, rode side-by-side with Nibali, and even managed to drop Rodriguez in the mountains. Having outperformed most of his expected rivals, he finally succumbed to the vicious 24% gradients of the Alto del Angliru. The final ten days saw an unexpected dust-up between domestiques, as Chris Froome took on Geox’s JJ Cobo in a fight that was finally settled on Pena Cabarga, where Froome took the stage but not enough time to claim an overall victory. Putting aside recent great races, a lot of the stuff that people complain about is the stuff that gives the Vuelta its character. When ASO and RAI plan the Tour and Giro, their intention is to showcase the most beautiful parts of their country. When Unipublic plan the Vuelta, they want everyone to know that they have some of the most advanced cement factories and smoothest motorways in the world. The race lurches from awesome red deserts of Granada to the scrublands and peaks of the Asturias, before unexpectedly detouring through an industrial estate somewhere near Alicante. It’s hilarious, and whatever else you may say about the Spanish, they know how to build a flyover. Then there’s the lack of attendance. No, not the absence of crowds (the blistering late-August heat keeps many fans indoors watching on TV), but the abesence of riders. As it's the final Grand Tour of the year, most of the big-name riders have met their objectives for the season and are off on a beach somewhere. Others turn up with the intention of spending a fortnight tuning their form before faking an illness in the third week to taper, ready for October’s World Championships. The Vuelta objects to being used as a training race for the Worlds, but it’s not as though ever had a glorious past: until 1995 it took place in April, and was frequently ignored in favour of May’s Giro. If anything, the move to September has added to the race’s personality. It’s now a last chance saloon for Grand Tour riders who haven’t performed as well as expected earlier in the season, and a baptism of fire for young riders looking to earn their shot at more prestigious grand tours. You can tell which cycling fans watch the Vuelta: when everyone started raving about Tejay Van Garderen in this year’s Tour de France, Vuelta watchers sniffily pointed out that they’d been saying he was one to watch since his spell in the young rider's jersey of the 2010 Vuelta. This year’s route has the potential to be absolutely gripping. 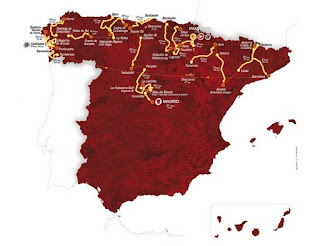 It’s confined to the northern half of Spain and seems determined to hit just about every hill and mountain you can think of, with one notable exception: there’s no Alto del Angliru this year. Not that it matters - there are 39 different hills and mountains in this year’s Vuelta, with 8 stages classed as mountainous and no fewer than 10 summit finishes. Ten! On top of that, there are only 55km against the clock, and 16 of those are the Team Time Trial. If you’re not a climber, there’s hardly any point in showing up at all. Mirador de Ezaro is a new climb for La Vuelta and comes at the end of an otherwise flat stage 12. At 2km long, you’d normally write this off as a pimple, but it has the potential to make a big difference to the shape of the GC. The first kilometre averages around a 14% gradient, while the second is around 16% average. That’s pretty steep, right? But those are only the averages. The max gradient on Ezaro is 29%. Yep, 29%. Mt Ventoux at its steepest hits about 12-14%. The Angliru and Zoncolan max out at about 24-26%. Even the short but eye-wateringly vicious climbs of the Tour of Flanders rarely break the 25% mark. Seriously, professional riders have suffered the indignity of weaving to a halt and falling over sideways on lesser grades than this. As if that weren’t enough, the 29% section is preceded by an leg-breaking 18%, followed by a 17% section, then has a few hundred yards of comparatively gentle climbing before rearing up again to break the 20% mark a second time. It may only be short, but most riders can only tackle gradients like that in survival mode: whole swathes of the peloton will be forced to do nothing more than watch any attacks that go away. The Ezaro has the potential to break the field into several distinct groups: Alberto Contador and Joaquim Rodriguez could explode up the steep bits, distancing the field. Chris Froome and possibly Alejandro Valverde won’t have the same acceleration, but will be able to ride it faster than the rest. Then the diesel climbers will chug up it in a steady, enduring fashion that would be tremendously effective on a long climb but something of a hindrance on this ‘pimple’, and finally everyone else will wobble up it. It’s far too short for insurmountable gaps to be opened up, but I can see some of the favourites buying themselves 20-30 (inc bonuses) seconds over each other here. Forward to 2:50 for the start of the climb. Then there’s Lagos de Covadonga. Spanish cycling’s answer to Alpe d’Huez is a long, misty climb through atmospheric scrubland past a pair of mountain lakes. At its hardest point it climbs through La Huesera (the bone woman), a battlefield from the Reconquista that has only recently stopped disgorging the bones of dead Moors after every rainfall. Seriously, this is a moody climb. The 12km ascent has a wavering gradient that averages 7% and tops out at 12%. The very next day, the riders will tackle three first cat climbs on their way to Cuitu Negru, a wavering, wobbling 23km climb that has spells at 14% punctuated by long stretches of deceptively shallow, leg-grinding false flat. Finally, there’s Bola del Mundo, site of Nibali’s race-winning defence in 2010. A 22km ramp that gets progressively steeper as it goes on, Bola del Mundo is a psychological test as well as a physical one. The narrow concrete tracks leading up the climb can’t always accommodate team cars, so the riders spend long periods away from their Director Sportifs, and the ramp-like profile is dispiriting for a lonely rider: if you’re suffering in the first five kms, tough - it gets steeper. If you’re suffering in the next ten km - tough, it gets steeper. That’s just four of the 10 summit finishes, and even the Time Trial has a third cat in the middle of it. Still, if the 2011 Giro d’Italia taught us anything, it’s that too many mountains can kill a race, as the entire peloton switches into survival mode and the first man brave enough to attack attains an irretrievable lead. I don’t think that’s going to happen here though. Too many riders have something to prove: Contador wants to put his doping ban behind him, Froome wants to show that he can win a Grand Tour, Rodriguez must be looking at the likes of Ezaro and Mirador and feeling like they’ve been included for his benefit, and rumour still has it that Andy Schleck might be fit in time to participate. So that’s second place sorted. I’m going to rule out Andy Schleck and JJ Cobo straight away. I never believed Cobo had even one GT win in him, so I absolutely refuse to consider the possibility that he has two. The minimal time trialling and total absence of downhill finishes would appear on paper to favour Schleck, but his participation is still doubtful and even if he is there, all that time off with injury means it’s unlikely that he’ll have any fitness. While on the subject of time off, Alberto Contador is an interesting proposition. He’s the most naturally talented and rounded stage race rider in the bunch. He’ll have spent his ban training hard and will almost certainly be physically strong enough to do the business. His racing wits might be another matter: about the only weakness Contador has is the occasional lapse of concentration - he sat in the middle of the pack and got stuck behind an echelon in the 2009 TDF, forgot to eat in the first mountain stage of the 2010 TDF, and sat in the middle of the pack and got stuck behind a crash in the 2011 TDF. Of course, in all but the third example he managed to pull back the time he lost, but still, his infrequent ill-positioning is one of the few straws his rivals can clutch at, and it’s possible that the Eneco Tour won’t have been enough to make his mind as sharp as his legs. Then there’s Chris Froome, who also has head and legs questions to answer. He was the strongest climber at the Tour, and while he can’t go up with the likes of Contador and Rodriguez, he’ll outclimb everyone else and lose minimal time to the two superior ascenders. His time trialling ability is strong enough to ruin Rodriguez, and he should take some time out of Contador against the clock as well. However, all this depends on two things: has he got anything left in his legs after the Tour and the Olympics? And more importantly, can he make the right tactical decisions for himself? His best results have come when assisting Bradley Wiggins. Before taking the role of super-domestique, Froome was best known for entertaining but fruitless do-or-die attacks, and it’s easy to suspect that his placings in the Vuelta and Tour were the result of allying his legs with Wiggo’s brain. He’ll have to prove that he’s as smart as he is strong. If he can do that, then he should have a fantastic ride, as he has the strongest team of the three main contenders. Finally, there’s Joaquim Rodriguez, the only man more explosive than Contador on the steep stuff. His weakness against the clock is unlikely to be a major factor in this Vuelta, and he’ll have had plenty of time to recover from his Giro d’Italia second place. As I type this, he’s having an exploratory dig at the front of the Classica San Sebastian, and he looks good. Unlike Contador, he can’t repeat his attacks over and over, but the memory of his breathtaking ride up through Asissi in May or his 2010 win on Pena Cabarga leaves you in little doubt that he’ll pick up time and bonuses on short ascents like the Mirador de Ezaro, as well as making some decisive late kilometre attacks on the long mountains. Ordinarily, I’m absolutely certain what the podium will look like. I’m not always right, mind you, but I always know what I think. This time though, I’m really struggling. I don’t think Froomedog can cope with Purito and Pistolero in the mountains, but I can’t see either of them matching him against the clock. I think Rodriguez can beat the other two over any short, uphill distance, but by small enough margins that he’ll need to do it on multiple stages to compensate for what he’ll lose elsewhere. I think Contador will take big time from everyone on several mountain stages, but only if he’s in form. I love the Vuelta as well - especially this year, with Froome going as leader and Contador's return, it could be better than the TdF. I agree with first and third on your podium, but I can see Froome struggling. He's shown no sign of weakness, but must be feeling the Tour in his legs by now. I can see him getting a lead in the team time trial on stage 1, but cracking sometime in the third week - possibly even on the penultimate stage. Also Cobo is a strange one. I think he suffers from quite bad depression which affects his performance; but he was so poor at the TdF that he must be at least trying to peak for the Vuelta again. What do you think about Quintana? I reckon a dark horse for top ten. He doesn't get much attention, does he? I know he did well at the Tour of Murcia, and got a stage at the Dauphine, and Movistar look strong to me, so why not?